Are American Car Buyers Really Re-Thinking Luxury? When Chrysler ran its 2011 Super Bowl ad for the Chrysler 200, all the attention was on the fact that the automaker spent $9 million on an unprecedented two-minute commercial that starred music legend Eminem. But there was a curious part of the ad's message many people missed. The Chrysler 200 is pitched in the ad as being not only "Imported from Detroit," but also as "luxury." However, the 200's sticker price ranges from $19,000 to $27,000 for the convertible version. Such a low MSRP hardly seems like luxury. But auto executives say the whole notion and definition of luxury has changed and continues to change as the country works its way through the economic hard times of the last few years. General Motors' Buick brand has never been considered genuine luxury, but that is the way the company is pitching it these days. 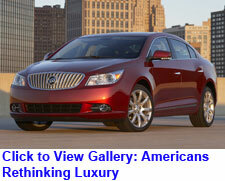 Ads for the Buick LaCrosse, for example, often compare the car to a Lexus. "Buick is a legitimate luxury car, and beats a Lexus ES350 on many features and performance, so we believe it absolutely is luxury people will appreciate as much for image as value," says Buick vice president of marketing Tony Disalle. Because some "mass-market" brands like Hyundai and Volkswagen have been introducing new cars that climb well above $40,000 and $50,000 price tags, and some luxury brands like Audi and Mercedes-Benz have slid down the price ladder to what is now Buick territory, the lines of "true" luxury seem to have blurred. "The luxury car is the one someone attending a country club doesn't have to explain," says marketing consultant Dennis Keene. But with country club memberships way down in the last three years, is that even a good yardstick? Industry consultants and marketing experts point to a generation gap the "near luxury" brands like Chrysler, Buick and even Hyundai are trying to exploit. "When baby boomers came of age and money, they rejected their parents' luxury brands like Cadillac, Lincoln and Buick," says industry consultant Cameron McNaughton of AutoPerspectives.com. "You have a new generation of buyers that over the next decade will move into the luxury segment and while they are aware of Mercedes, BMW and Lexus they think of them as their 'parent's cars,' not necessarily a fatal flaw, but they are certainly not perceived as being that special," says McNaughton. W hen Lexus's top selling sedan, the ES350, has a starting price of $36,000, and a Buick has a comparably priced, better styled and comparably or better equipped LaCrosse for $33,000, who is to say which is the true luxury car? Additionally, says McNaughton, "A lot of people entering the luxury car category are also going through their first real recession and they are going to define 'value' a little differently and want to demonstrate it." Charles Kelly, a 38-year old digital advertising executive in Leonia, NJ is one such car shopper looking through a different lens. His company did well last year, even in the difficult economy, and he wants to spend some of his bonus trading up to a better set of wheels. "I had Jeep, and now I'm looking for a nice looking sedan." What's on his shopping list? It's a surprising mix: a BMW 5 Series, Chrysler 300C and Cadillac CTS. "The BMW 5 is the most expensive, but will hold its value better than the other two, but I'm looking at the Chrysler and Caddy seriously because I like the styling and they are considerably less expensive." The image factor? "All three are great looking cars and perform well, and that's all I really care about," says Kelly. One of the ingredients to establishing true luxury credentials for a brand whose prices start at or below $30,000, which is the case with Lexus and Buick, is a "halo" vehicle. "It's easier for a $30,000 Lexus, for example, to have credibility and cachet with the wealthier consumers as true luxury when the top of the brand, the LS400, is over $70,000. Even Lexus, the number-one luxury car brand in the U.S. based on sales, though, has seen the gap between its prestige and that of Mercedes-Benz. And maybe it is feeling the hot breath of brands like Hyundai and Buick on its rear fenders, which is perhaps why the Japanese brand is launching the $375,000 Lexus LFA super-luxury car at the end of this year to boost its luxury credentials. "That's pretty 'old school' thinking," says Ford global marketing chief James Farley, who ran the Lexus brand for Toyota before coming to Ford in 2007. Farley is trying to revive the Lincoln brand for Ford, since the company sold off Jaguar, Land Rover, Volvo and Aston Martin. Lincoln will introduce a new car priced below $30,000, but Farley says he is not interested in an expensive halo car such as a rear-drive sports car priced above $80,000. "I don't believe people buying cars below $50,000 care one way or the other if you have a six-figure super car in the showroom...this is a different time than it was," says Farley. VW and Hyundai "Movin on Up?" In 2004, Volkswagen, which literally translated means "the people's car" tried to go way up the price ladder and launched the Phaeton luxury sedan, which carried a sticker of $85,000 and legitimately rivaled a Lexus LS400 or Mercedes S Class, for features and comfort. But it is widely considered a marketing and business fiasco. VW also sells a Touareg SUV that can cost over $60,000. "It is relatively easy for a luxury brand with true up-market cred to introduce lower priced models, but it is devilishly hard for brands whose popularity is at the low end of the market to reach up that far," says consultant Keene. Now, Hyundai is pursuing a similar strategy, though it has enjoyed better success than Volkswagen in some ways. The Hyundai Genesis was modeled after the BMW 5 Series, and is the Korean automaker's attempt to move the Hyundai brand up market so that it can cover every kind of buyer. It sold 22,000 of the $33,000-plus sedans last year in the U.S., about four years worth of VW Phaeton's global sales. This year, the company raised the bar higher by introducing the $58,000 Equus sedan. Swedish automaker Volvo, which was acquired by Chinese automaker Geely last year, has never quite been considered a luxury car. In Europe, as well as the U.S. it has been more akin to Buick or Chrysler -- premium, but not luxury. But Volvo CEO Stefan Jacoby, who went to Volvo last year from a post running Volkswagen in North America, says he is leading Volvo "to a true luxury brand positioning." Jacoby says the cars will be more luxury focused in design and features. "At the same time, though, I absolutely believe and see that the idea of luxury is changing with a new generation and that we can appeal to those who don't want to be so flashy or extroverted in showing their wealth...I think there is a quieter luxury customer that is growing in number." Buick, Chrysler, Volvo and Hyundai will always be tough sells on Wall Street where Goldman Sachs bonuses are back in full force. That's money that sends traders and partners to the Mercedes and Aston Martin dealers. But the fact is there are fewer members in the fat-wallet brigade than there was before the financial meltdown of 2008. Unemployment remains high, as does the number of people who just aren't looking for work any more. To a lot of people who are redefining their lives with less money than they used to have, a $30,000 Buick that drives and feels like a much more expensive Lexus or Mercedes is going to feel like luxury enough.